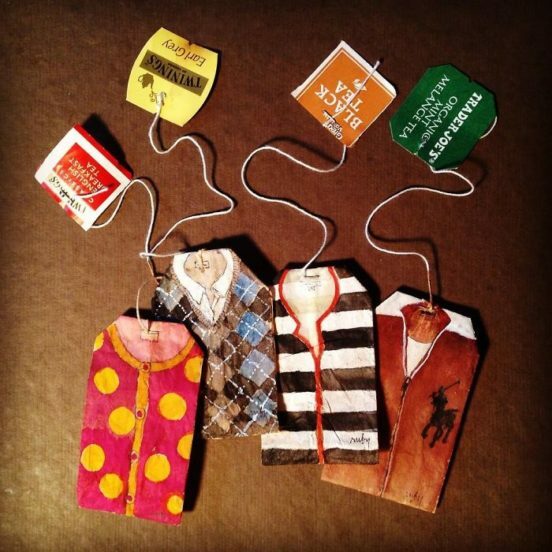 If you’ve ever wondered about what to do with all those used tea bags that get thrown in the trash, artist Ruby Silvious has an incredible idea. Why not use them as art? 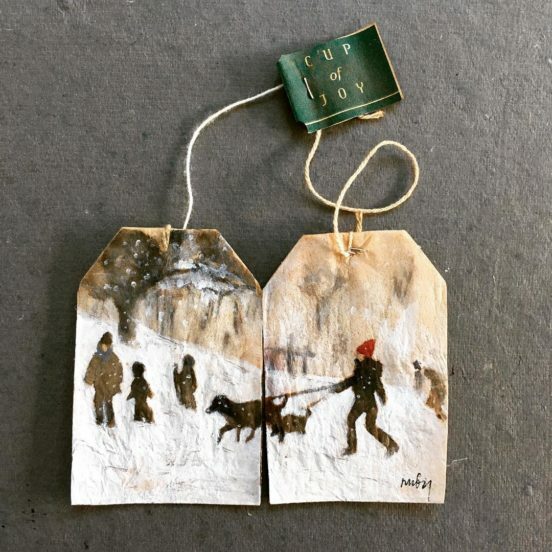 If that sounds far-fetched, take a look at the incredible miniatures she makes from old tea bags. 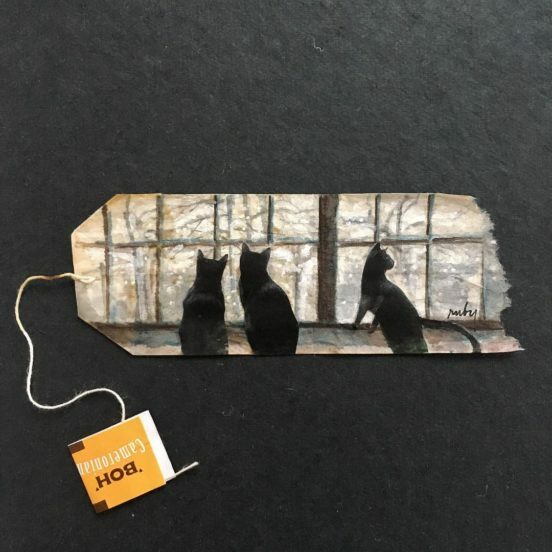 The thin paper which houses tea leaves turns out to be the perfect canvas for tiny paintings. The subject matter of Silvious’ art is the perfect complement to the tea bags themselves, and the art of making and enjoying a cup of tea. Her paintings show small scenes from our everyday lives, like cats watching out the window on a cold winter day, and laundry drying on a clothes line. 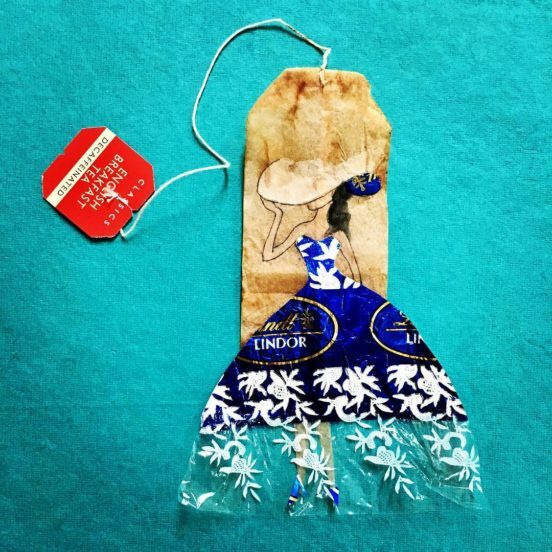 She uses a Lindor chocolate wrapper to create a woman dancing in a marvelous blue dress. Silvious’ process begins by drinking a cup of tea and then laying the bag out to dry. Some bags are emptied out and cut or elongated. Others are left intact and stapled, as Silvious has perfected emptying the contents without disturbing the bag. She opened and instagram account just to see what happened when she started posting her daily creations and much to her surprise, they became a viral sensation almost immediately. Silvious found inspiration as a visual artist and graphic designer who enjoys reworking found and recycled materials into something new. The genesis for the tea series happened in 2015, when she decided to make a visual daily record of her tea-drinking and her impressions of each day. Silvous emptied the used tea bag and then used it for paintings and art objects. Her paintings and prints are moody, whimsical and experimental. Her tea bag journey has now resulted in a coffee table book called 363 Days of Tea: A Visual Journal on Used Teabags, published by Mascot Books. Silvious lives in Coxsackie New York and was educated in America, Asia and Europe. She has been featured in collections and solo exhibitions around the world. Silvious’ forays into tea continued with curated exhibitions in Japan and France. Silvious excels at turning small, fragile objects into art. One of her most popular series is paintings on eggshells. 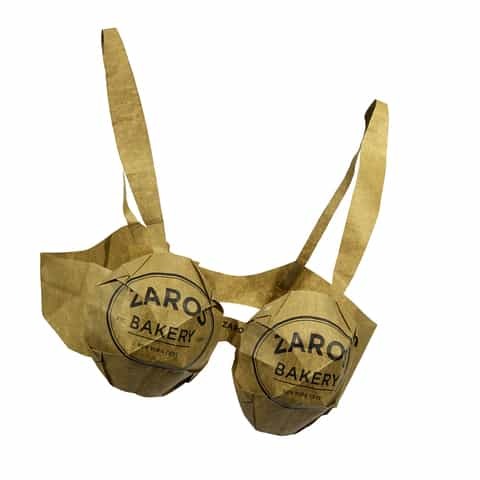 Her Oribrami series is an ingenious look at empty food wrappers, which she turns into whimsical bras. Silvious has been known to paint even on small pistachio shells! She is also a talented painter and collage-maker. Silvious has said she works on graphic design by day, and as an artist at night. Most of her creations are not planned. Instead, she prefers to live and work in the moment, creating things that capture the way people feel in a given moment by helping them see the objects around them in a different way. Silvious says she hopes people will begin to have a more expansive view of what constitutes art. In the tea series, she wants to inspire people about the art of the possible. Her artwork has already inspired others to use teabags for their own art. Silvious receives photographs from fans who send her pictures of their own creations.